An outspoken free press is one of the great obstacles to demagogues, who prefer simplistic propaganda to open public debate. The Trump government exemplifies this maxim. It loathes both honest reportage and critical opinion, it seeks to brand uncomfortable truths as lies, and through making direct contact with its audience it tries to evade the filters of fact-checking and sceptical assessment. Whether or not Trump and his entourage understand this, these moves propel them ineluctably into the realm of history’s past masters of political propaganda and the repression of dissent. ‘Good evening. Thank you guys for coming. I know our first official press briefing is going to be on Monday, but I wanted to give you a few updates on the President’s activities. But before I get to the news of the day, I think I’d like to discuss a little bit of the coverage of the last 24 hours. 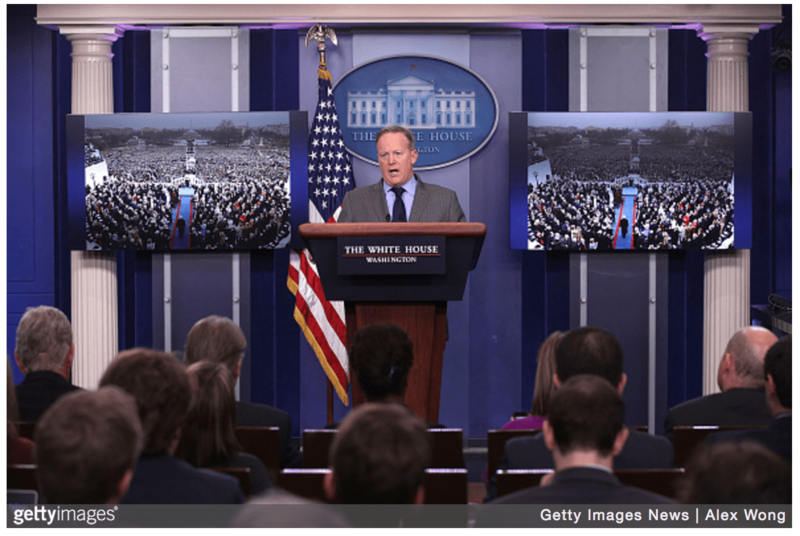 White House Press Secretary Sean Spicer makes a statement to members of the media at the James Brady Press Briefing Room of the White House January 21, 2017 in Washington, DC. ‘Before this meeting opens, I would like to make a few remarks. To begin with, I would like to take issue with a series of attacks by the Berlin press, which does not want to see me being broadcast by the entire German radio network, because what I have to say is too insignificant, too trivial and too mendacious to be brought to the attention of the whole world. 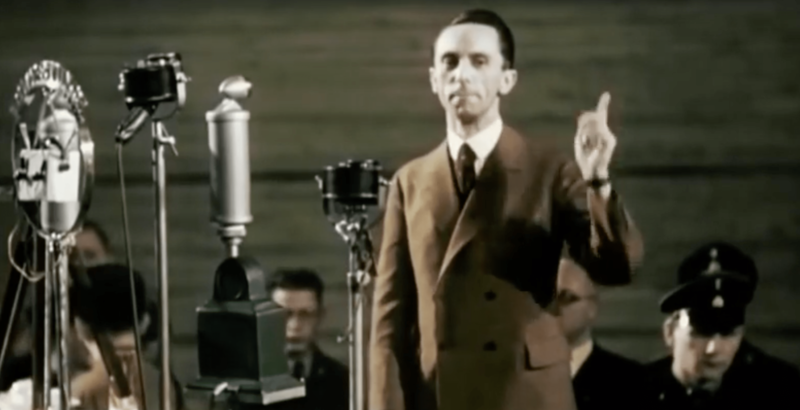 Speech by Joseph Goebbels, Berlin Sportpalast, 10 February 1933. ‘This evening you are witnessing by eye and ear a mass event of a scope that has no precedent in Germany, probably in the whole world. I think it would be not be saying too much to assert that this evening at least twenty million people in Germany and beyond Germany’s borders will be listening to the speech of Reich chancellor Adolf Hitler. In Berlin alone, in addition to this great mass demonstration in the Sportpalast, ten large loudspeakers have been installed in public places. And already literally walls of people are assembling at these loudspeakers, and at least 500,000 or 600,00 members of the public who will hear this speech are standing by these loudspeakers’. ‘The President is committed to unifying our country, and that was the focus of his inaugural address. This kind of dishonesty in the media, the challenging — that bringing about our nation together is making it more difficult. There’s been a lot of talk in the media about the responsibility to hold Donald Trump accountable. And I’m here to tell you that it goes two ways. We’re going to hold the press accountable, as well. The American people deserve better. And as long as he serves as the messenger for this incredible movement, he will take his message directly to the American people where his focus will always be’. ‘One has to govern well, and alongside good government conduct good propaganda. The one belongs with the other … If the Jewish press still thinks it can intimidate the National Socialist movement with veiled threats, if they think they can evade our emergency decrees, they should watch out! One day our patience will run out, and then the Jews will find their impudent, lying traps plugged…. ‘That is what I wanted to settle with the opposition press and the opposition parties. That is what I wanted to say to you personally across the German broadcasting system and its millions of listeners’. ‘The media should be embarrassed and humiliated and keep its mouth shut and just listen for a while. I want you to quote this. The media here is the opposition party. They don’t understand this country. They still do not understand why Donald Trump is the president of the United States’. Fine scholarship, and deeply troubling. I can only hope our European friends will one day forgive us for this disaster. Let’s hope we’re all still around to seek forgiveness. We do NOT blame you. So there is no need to forgive. We fear for you. The biggest worry is that he might succeed. Than live will change for all of us. Spine chilling. Thank you for juxtaposing these quotes. Would you be so kind as to add a bit of contextual analysis to the language parallels you so deftly depict in this post? It would be helpful for your non-historian readers. Thank you for your comment, and for your interest in History Workshop. While Professor Caplan is more than welcome to reply in order to add contextual analysis, she was only asked to add a very brief statement by way of introduction to the quotes. We hoped that by placing the quotes selected by Prof Caplan into proximity with each other, comparisons and relationships might be drawn by readers, sparking useful conversations. Already there has been great interest in this post, and we look forward to seeing what conversations develop. Thank you for your timely analysis. Contextual analysis comes in many forms. For my money, you will find one of the most interesting analyses of Goebbels and his legacy in Jacques Ellul, “Propaganda” (1965). It’s still relevant, more than ever. One of the most troubling parts of Trump’s speech, which was reiterated by Spicer in a paraphrased fashion, was the suggestion that power was being transferred not just from one administration to another, but away from Washington (to “the people”). “Every four years, we gather on these steps to carry out the orderly and peaceful transfer of power…….. I found that very threatening. A regular transition is “a mere” transfer of power, “from one party to another”, “however” this one has a “very special meaning”, Trump says. Yet nobody in the USA can “transfer power from Washington DC”, as that power is founded and protected in The Constitution. Indeed the Constitution is all about that power and the manner in which it is not directly controlled by “the people”. I tend to take people literally. So, maybe Trump was being metaphorical? But Washington needn’t be the seat of Government – Trump wasn’t “transferring power” because of his distaste for the city. No matter how metaphorical Trump was being, no matter how much licence one grants him for poetry and political rhetoric, what he suggested is completely inimical to the Constitution. It’s called sedition. It becomes hugely ominous when the Nazi view held that Hitler was the embodiment of the German People, his actions were their actions, their wishes were his wishes. Being the same, nothing could come between them; there could be no difference. No mere law, no mere Constitution could be tolerated to restrain the peoples’ will, so how could it restrain their leader, their embodiment? The Leader becomes The Law, The People’s Will. I doubt Trump knows much about it, but Bannon does. Bannon would also have known exactly what putting “America First” into that inauguration speech meant. And what “transferring power from Washington DC” means. If it walks like a duck and quacks like a duck, it must be one. Goebbles was one of the most evil men ever and had Hitler’s ear from the beginning. 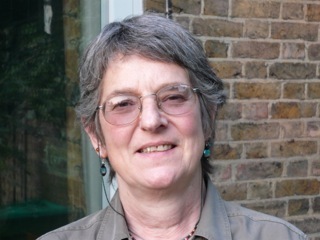 I am a retired professor of US and Modern European history. I wrote my thesis on Hitler and Churchill and the efforts both men used to silence each other. The resemblance to what happened then and what is happening now in the United States is eerie and sickening. That so many are too ignorant to realize the similarities lies at the feet of our education system. We stopped teaching the hard, bloody truth and dressing it up in silks and satins to cover the despicable actions of the Fascists who ruled half the world until the other half stopped them at great cost. Too late, but never mind. I went to high school in Mississippi in the 1960’s … they weren’t teaching about Goebbels and Hitler then either. History was taught sequentially, by the time we reached the 1930’s we were about out of time. The 1930’s discussion was mostly about the pernicious New Deal. WWII was mentioned briefly to allow glorification of US as savior of Europe, not to talk about causes or results of the war. Sigh. And of course, Bannon is a (metaphorical) reincarnation of many of the idea-generators of the Jim Crow South. Only much worse. If everyone who voted for President Trump could be made aware of the causes of our fight against Nazi Germany in WWII and the fact that so many died in the effort to overcome fascist aggression, perhaps the Trump administration could be awakened to the sound of its own voice and realize that it could happen here. “America First” is beginning to sound like “Deutschland Uber Ales”, and I’m not referring to Beethoven or the German National Anthem. Interesting but I fail to see how comparing the The Trumpeters to the rabid antisemitism of the Nazi era helps in undermining Buffoon’s administration. Every history I’ve read of that era traces the German problem of Nazi antisemitism to centuries of poisoned Christian/Jewish relationships; most notably and spectacularly in early medieval morality plays, the later condemnations of Jews by Luther, the KulturKampf followers of Bismarck (virulently ant-Catholic to boot). Laying Goebbels’ brief at Trump’s doorstep allows Trumpsters to dodge the fundamental reality of his unfit temperament, experience, morality ( in its broadest sense of “honesty”) and intellectual depth for the office. Additionally, his disqualification in physiological terms, demonstrated by his frenetic and imprudent tweeting about everything from nuclear arms to missile tests and the presence of “enemies within” everywhere, is insufficiently scrutinized by press and public because of the hurling of Nazi charges. He’s a demagogue but all demagogues are not Nazi’s even though most demagogues use the same disreputable tactics. To throw Goebbels and Trump into the same basket denigrates the viciousness of the Der Reichsminister für Volksaufklarung und Propaganda, Goebbels, (who poisoned his six children in the Hitler Bunker in Berlin as the Americans approached). It also gives our Buffoon a hiding place. Robert Clarke: You make excellent points here. BTW, if you happen to know any good friends who are psychiatrists, please ask them what they think about mental status and personality of President Trump and ” President’s men”, you will be told that these psychiatrists are forbidden to make judgements about persons whom they never mer or public figures. Trump is categorised as narcissistic, a personality disorder and classic sociopath. Lying, bullying , personal charms where required,grandiosity etc. are some of thelse traits. I mean no disrespectful to high office of Presidency. All I can say is get down on your knees all you people that have a working brain and any common sense and realize what is now happening in our America and who is doing the damage. While you are down there pray as if your life depends on it because it could. I read this the day after people were beaten unconscious, kicked while on the ground, and pepper-sprayed for wanting to hear a man exercise his right to free speech at the home of the free speech movement. I like millions of others breathlessly await similar acts by Trump supporters, yet they are not forthcoming. If Fascism dawns in America, it will not be established by Trump, and baseless scaremongering sophomore-leftist rhetoric like this was one of the main vectors of his election. Well done. There is, of course, the possibility that Antifa is a false flag group organized to discredit the Trump opposition with a series of small violent acts — leading up to, say, a fire in a major government building. “Divide and rule” is, after all, a well-proven tool. Or it could just be a bunch of blockheads who don’t understand the use of violence within a structured, disciplined and objective-driven scheme in pursuit of political power by other means. Quotes from Joseph Goebbels, Nazi Minister of Propaganda; Does this sound familiar? Santayana, as “Those who cannot remember the past are condemned to repeat it” I believe, although we seem to ignore the advice regardless of its source. It seems there is no reaction of Trump-voters here… That in itself worries me. This clever observation of the parallels between Spicer, Goebbels and Bannon needs no context. These are amoral manipulators, serving a vindictive amoral manipulator while serving themselves. Are we trapped in a cycle, doomed to experience the heartlessness of power-seekers at least once in each generation? It seems clear that, at a formative level, History is being taught selectively and superficially and is neither questioned nor examined. This is a perfect sequel to Jane’s previous article. Trumps has the simplistic world-view of Western films: good dudes versus bad dudes. He talks and thinks in slogans. That’s an end to it. Whether he’s sowing the seeds of an end to the world is another matter. Are you kidding me, what you’re claiming as truth is total horse manure. Liking the press secretary lecturing the media; as every press secretary of every former President in my lifetime has done; to Nazi propaganda because of your personal views only inflames emotions and does nothing to promote or strengthen a positive relationship to help end this useless divide. Again and again, Trump has vowed that he is going to “do something about“ the right of the media to distribute what he calls “fake news“. Yesterday Spicer started by restricting access to his news biefing to the media tha Trump likes. New York time, Guardian and CNN were kept away. There is never only one version of the ‘truth’. The media story is always distorted by the view of the narrator and in the real world this view is then approved for publication or not by the editors and the media owners. Every news story, and even the historical record is coloured by the interpretation of events by the narrator. We can rarely know what influences the narrator is subject to, but there is always an ‘agenda’ – a spin. Every story is a sales pitch aimed at influencing the buyer to buy into an idea – a view of the world. The purpose of education is to teach people to think and interpret the story. (Unfortunately education itself is hijacked by propagandists) Democracy relies on the population being able to discern their best interests and to vote for that best interest. Some people will consider their best interest in very narrow terms and others will take a wider view. The recent furore in the media implying that ‘alternative facts’ are some new concept invented by Donald Trump is pure nonsense – a non story. No one has to swallow propaganda we have to chew it and then decide whether to swallow it or spit it out.